Nature’s Variety is offering Free Samples of their Instinct Raw Boost Dog Food (and cat food). Instinct® Raw Boost™ is the first ever grain-free kibble with freeze dried raw in the same bag. It's never been more convenient to nourish your dog with the nutrition of raw. The grain-free kibble provides low carb, high protein nutrition along with freeze dried raw pieces to give your dog a bite-sized boost of healthy raw food. 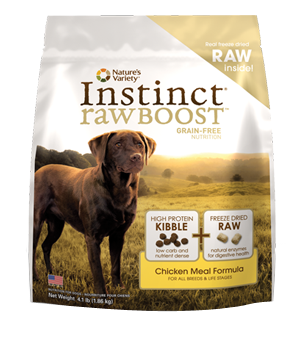 To get your Free Sample of Instinct Raw Boost Dog Food (or cat food) from Nature’s Variety, become a fan on their Facebook page and fill in the form. "Offer only good while supplies last. 18 years or older. Limit one sample per household." Postal Puppy Box Giveaway WINNER!